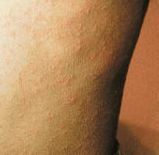 " There are many names for baby heat rash including prickly heat rash and Miliaria. Baby heat rash is caused by overheating and is seen in 15% of newborns. It occurs when the sweat glands are not able to keep up with the cooling needs of the body. In a newborn, this can be due to immature or obstructed sweat glands. Symptoms appear under diapers in the groin area, under tight fitting clothing, and other areas of the body including the armpits, upper chest, forehead and neck. It may even spread across the scalp or forehead if your child wears hats. Treatment involves keeping the baby cool, dressing the baby in loose fitting cotton clothes, or just a diaper. To help the body cool, try baby powder made from cornstarch. Move the baby to a cool room that has low levels of humidity such as an air conditioned area. Call a Doctor if the baby is fussy, if the rash has scabs, sores or blisters, or is there are signs of infection such as a rash that is red, causing pain, feels warm, is resulting in a fever or has pus coming from the rash." What Causes Baby Heat Rash? Dr. Rajdeep Mysore describes the causes, symptoms, treatment and prevention of heat rash in babies or prickly heat. If the sweat duct or hair follicles can’t sweat naturally, they form miniature blisters, and the sweat left on the skin causes irritation and thus a skin rash. If your baby gets too hot and can’t cool down because they can’t sweat properly, they face the risk of overheating and dehydrating. This could result in heat stroke or heat exhaustion. Heat rash is caused by being dressed too warmly. 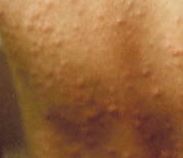 It occurs in skin areas that are covered with clothing. Diaper rash occurs when a wet diaper is worn for an extended period of time. The first signal that your child may have heat rash is usually the red rash and small blisters in various locations on the body. There are four categories of baby heat rash, and the last one, baby miliaria pustulosa, is very rare in infants. Miliaria crystalline (also spelled crystallina): a scaly cluster of small watery blisters. Miliaria rubra (prickly heat): shows the same small watery blisters as miliaria crystalline, but tiny red bumps or patches are present around the affected areas. This is the most common form of baby heat rash. Miliaria profunda: easy to spot due to its skin-colored bumps. Miliaria pustulosa: pustules form due to bacterial infection. Usually, if you catch heat rash before it gets too serious, it will fade away on its own. If it doesn’t, call your doctor. 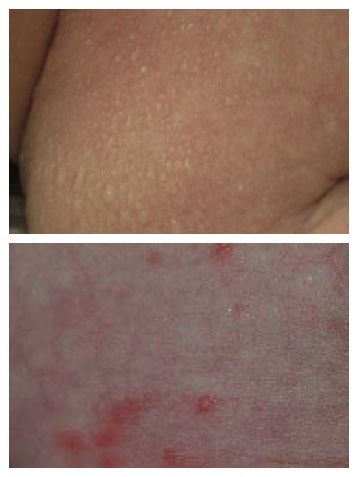 Heat rash is evident on visual examination. The same holds true for the other forms of this rash; again, it is diagnosed on appearance and by your answers to questions about heat exposure. If your baby has a more advanced form of baby heat rash, the doctor may want skin cultures, skin biopsies or want to exam skin scrapings under a microscope. They may also run tests for bacterial and fungal infections, allergies and eczema. Nurse Dani from Intermountain healthcare discusses how to treat heat rash including keeping your child as cool as possible, particularly moist areas such as the armpits and diaper region. Dry the areas that are moist and continue to monitor. Keep the child well hydrated in the heat. There are several options available to treat these rashes in children. Most have to do with keeping a baby cool and out of the heat and humidity. Once out the heat, the baby's natural ability to sweat can help return the skin to normal. Avoid covering your infant with oils or ointment so as not to clog any skin pores. Cool your baby down and ensure they get lots of fluids to stay hydrated. Lower the temperature in your home, or get into shade and remove excess clothing. Wash rash areas gently with soap for sensitive skin and dry thoroughly. Give baby a coolish bath. Put clean cotton material under skin folds to soak up sweat. You could try ice packs, but ask your doctor about this, as you will not want to leave them on too long. In addition, you will want a thin cloth between the skin and the ice pack. Don’t put an ice pack directly on your baby’s sensitive skin. Hydrocortisone OTC often helps tougher cases of baby heat rash. Prescription cream from the doctor, such as triamcinolone may be useful. If your baby has a bacterial infection, your doctor may prescribe antibiotics. Antihistamines (Claritin or Benadryl) may be considered, but speak to the doctor about the right dose for your baby. Aloe vera cream lotions or gel. Honey paste rubbed gently into the skin. Cool bath with baking soda. Talcum powder to help keep baby dry, If you don’t have talcum powder, cornstarch will work. Keep room temperatures cooler in Spring/Summer. Use cotton clothing, not synthetic fabrics. Apply baby powder made from cornstarch. The bottom line when treating heat rash in infants is to catch it early, keep the infant in a cool area, and dress the baby in just a diaper or loose fitting cotton clothes. Corn starch baby powder can help keep the infant cool. Symptoms should go away on their own. As with any skin disease, call a Doctor if you notice a worsening of the baby heat rash condition or any other changes in skin condition or behavior. To prevent the condition, avoid hot or humid weather.